You’re thinking about getting one or several porcelain veneers to completely transform the appearance of your mouth, but you haven’t decided whether or not this dental treatment is right for you. We’ll give you the pros and cons of veneers in this blog post. But first, do you know which changes this dental service can achieve for your mouth? What can porcelain veneers can do for your mouth? Everyone wants a sparkly, white smile, but not everyone has a smile to be proud of. Maybe your teeth are discolored from smoking or drinking coffee. Or maybe you have chips, cracks, slightly uneven teeth or a gap in your smile. Porcelain veneers can fix these problems. And if your teeth don’t respond to teeth whitening treatments, porcelain veneers may also be a great option. 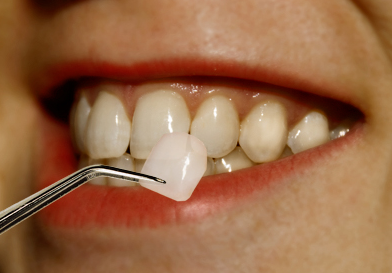 Here’s how they work: Thin tooth-colored covers made of durable porcelain are customized to fit your tooth and then are attached to the front of the tooth with a special adhesive. You will receive a significant and immediate boost to your self-esteem and self-confidence. You will get your dental problems fixed with a material that mimics your natural teeth. No one will know the veneers aren’t your natural teeth. The color can be selected from many whiteness shades. The process is painless and quick–only two visits are required! Porcelain veneers are durable and long lasting. If you take care of them properly, you should be able to wear them for up to 10 to 20 years. Porcelain veneers are stain resistant, so they won’t become discolored by smoking or drinking coffee, tea, and red wine. No follow-up maintenance is required beyond normal brushing and flossing. Veneers are a wonderful advancement, but they are one of the more expensive cosmetic treatments for teeth. However, most people only have them placed on the teeth that show when you smile, which reduces the cost. When you have veneers, your teeth may be more sensitive. After veneers are placed, the process cannot be reversed, as the dentist may need to remove a small amount of enamel to make room for the veneer. Veneers aren’t good for people with decay, fractures, or large fillings. You may need crowns if your teeth are significantly weakened. Also, we don’t recommend veneers for people who clench their jaws and grind their teeth. If abused, they can break, fall off, or become decayed, which will cost a lot of money to repair. To minimize this risk, brush and floss them as normal, and don’t bite your nails or chew on pencils and other hard objects. Our dental practice in Fairfax, VA, wants to give you a reason to smile! One way we can do this is by creating custom veneers just for you. Imagine being happy to smile and show off your teeth. Are you ready? Call us at (703) 997-0928 or fill out our form online today to schedule your appointment with one of our highly skilled cosmetic dentists to determine if dental veneers really are the best option for creating your beautiful smile!